Four points from a home tie with Manchester City and a potential banana skin of an away game at Hull City (go Team Tigers!) before the international break was a good return for Villa, especially when considering the absence of Christian Benteke up front, although the home loss to Spurs at the weekend was disappointing in terms of both result and performance. 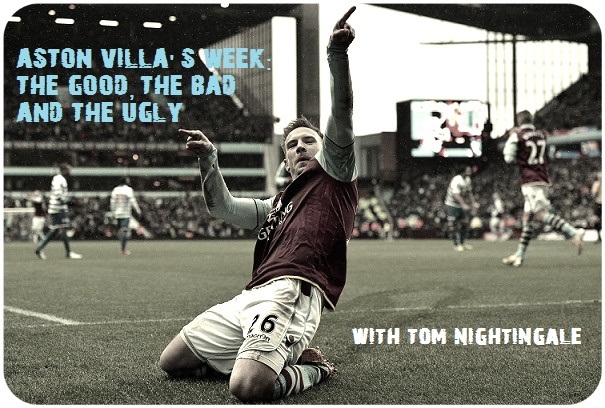 Here’s the Good, the Bad and the Ugly of the last couple of weeks at Aston Villa. Any Villa fan would be forgiven for having hoped for four points from the City and Hull games, but it’s a fair bet that most of those fans probably would have been optimistically looking at a draw at home to City and another win away from home at Hull. Yes, the 3-2 win over City had a slight air of a smash-and-grab about it, but it was the kind of win that you could not see Villa achieving. Villa’s home form has been their Achilles heel for years now, and before the tremendous victory over the 2011-12 champions, Villa only managed to overcome Rotherham at home this season, losing to Liverpool and Newcastle in the league before being thrashed 0-4 by Spurs in the League Cup. Villa finally managed to show the kind of fight that they have shown in every game so far this season on the road in front of their own fans at Villa Park, and showed once again that anyone can beat anyone in this season’s Premier League. Karim El Ahmadi came up with a strike which his performances in the first two months of the season have merited, Leandro Bacuna’s first goal for the club was a beauty, and though Andi Weimann’s 75th-minute winner was opportunistic, it was great to see the Austrian, who has been misfiring in 2013-14 so far, get off the mark in the league campaign. A clean sheet at Hull the following week consolidated the City win. It was a poor game, and the Match of the Day editorial team did well to find any highlights worth showing, but it was a second clean sheet in three league games for Villa after the club record nightmare spell, and sent Villa into the international break in a good position to build upon. The club vs country debate emerged again during the international break, as Belgian manager Marc Wilmots insisted upon calling injured Christian Benteke up to his squad for the team’s two World Cup qualifying matches with Croatia and Wales during the season’s second international break. Benteke was initially ruled out for four to six weeks after injuring his hip in the win over Norwich on 21st September. However, after less than three weeks on the sidelines he was called into training with his international teammates, and although Villa secured seven points from an available nine in the three Premier League games before the break without the Belgian, it’s a worrying sign that it was out of the club and Paul Lambert’s hands as to whether our key player was called up for his country despite being ruled out of action through injury. The home defeat to Spurs last time out was disappointing. Not necessarily surprising in terms of the result, but the manner with which Villa went down – pretty much without any fight – was the kind of performance that has unfortunately undermined the character and impressiveness of the win over City in the previous home game. Yes, Spurs are a side packed full of talent, but 37% possession at home is poor even if you argue that Villa are the kind of team who hit their opposition on the break even at home, and to turn up seemingly just to get the defeat over with was sad to see. Everton at home is up next, a fixture which has usually produced great games in recent years. It could just be that another full-blooded and hard-fought edition of the most-played English top-flight fixture could be just what Villa need to put the Spurs defeat behind them.